Adam Shoalts dragging the canoe upstream. In June of 2015 I decided to return to the Hudson Bay Lowlands—-a vast subarctic swamp that has the highest concentration of blood-sucking insects on earth—-in order to explore and map a little known river there. On most maps, it appears as a squiggly little blue line, a tributary of the isolated Brant River, which flows into Hudson Bay’s polar bear infested southern coastline. However, as often proves the case when dealing with obscure geography, other maps label this fork in the river as the “Brant River” itself. Regardless, I was enticed by the prospects of this remote waterway; which I’d first wanted to explore back in 2011 for the Royal Canadian Geographical Society, before I ended up settling upon several different rivers to the west. Four years later, this river was still in the back of my mind—-and I decided that, in between archaeological digs, I’d try to canoe it. For this expedition, I wanted a partner—-after all, this was polar bear territory, hundreds of kilometres from anywhere. I’d spent my fair share of time doing expeditions alone in the heart of polar bear territory—so I figured that I didn’t want to push my luck any further. Besides, sometimes a little company is nice. So I called up Chuck Brill, an American real estate agent and experienced angler, hunter, and all-around outdoorsman, who had expressed an earlier interest in joining me on one of my adventures. It was pretty short notice—-3 weeks. I wanted to go in June before most of the sea ice had melted and the polar bears—which normally are out on the ice hunting seals—-had come ashore, when they are at their most dangerous. Chuck expressed an immediate interest, and before long we were on a float plane together heading due north to Hudson Bay. 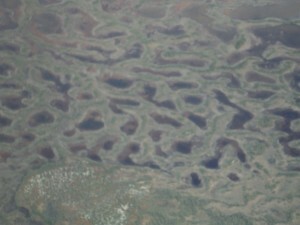 View of the Lowlands from the air. Our pilot dropped us off on the Brant River’s mouth, out on the open, windswept tundra of the subarctic. 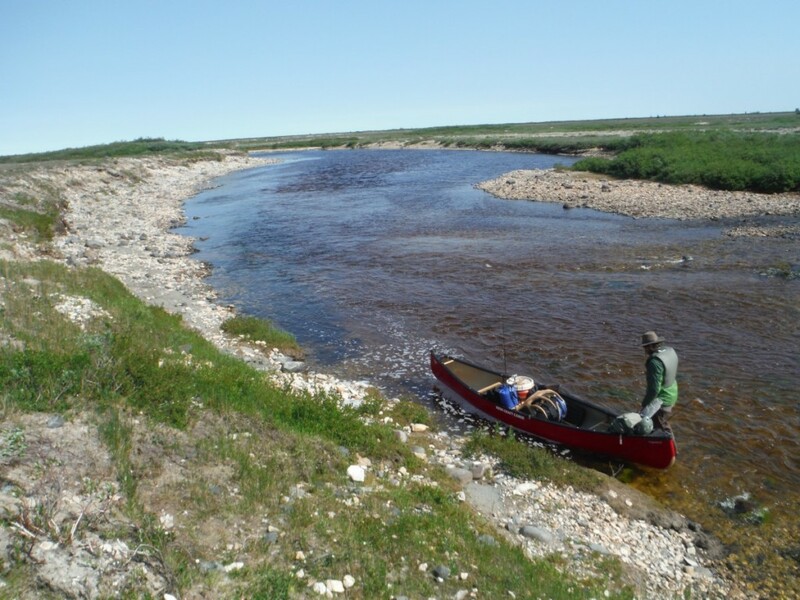 From there, the plan was to head upriver, taking the Brant’s officially nameless western fork, and following it upstream, against the current, for about 150 kilometres, to its swampy headwaters in the middle of an immense, bug-infested muskeg. We’d then turn around and paddle the river back to the sea coast, where the pilot could safely land and pick us up again. Naturally, it would have been much easier, and nicer, to take a helicopter to the river’s headwaters, get dropped there, and paddle downriver with the current to Hudson Bay. But the cost for the helicopter charter was around $25,000, and there was no guarantee we could even fit our canoe into the chopper. Part of being an explorer is figuring out how to do things on a budget. A float plane could land at the river’s mouth for about half the cost. Sure, we’d have to cover twice the distance, including an arduous upriver journey doing things this way, but with limited funds there was no other option. Plus, it makes a better adventure. 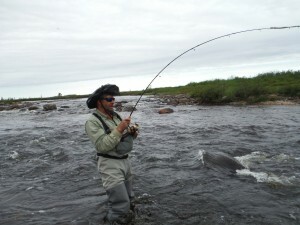 Chuck fishing on the river’s lower part, still on the tundra. We managed to cover about 15-20 kilometres a day on our upriver travel in our brand new 15-foot canoe, provided by Nova Craft. The river at times passed through shallow, rock filled rapids, where abundant speckled trout were to be found, and at others through wider, calmer stretches, where we caught northern pike. As we journeyed south along the river’s snaking course, we gradually left the open, grassy Arctic tundra behind and entered into the confines of coniferous subarctic forest. However, only a short distance (usually no more than a kilometre, and often considerably less) beyond the river banks the forest gives way to open, trackless muskeg, more water than land. Such boggy ground makes excellent mosquito breeding habitat, and for that reason, exploring the Lowlands in summer comes at a steep price: literally dark clouds of swarming, bloodthirsty insects. Clouds of mosquitoes swarmed us as we ventured upriver. Eventually, the river narrowed to little more than a creek. It was still about a metre and a half deep (four feet), but numerous log jams from spruce and tamarack falling across the waterway made for slow-going. We were now spending our days hacking through log jams with hatchets to clear a channel for the canoe; or else lifting the canoe up and over the logs, or pushing it under them where possible. 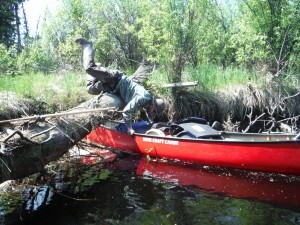 After about a day of this it was clear canoeing was no longer in anyway feasible. So, we made the decision to leave our canoe and any other unnecessary gear behind and continue on foot. Thick forest and willows cloaked the river’s banks, making travel on foot difficult, to say nothing of the bugs. After about a kilometre Chuck’s knee was causing him some problems, and he decided to return to our base camp. That left me to push on alone as far as I could. Getting around a log jam. The river became smaller and swampier as I struggled through a jungle of willows along its banks. Beyond the willow swamp was typical Lowlands forest, sparsely treed tamaracks and spruce, with innumerable deadfall. 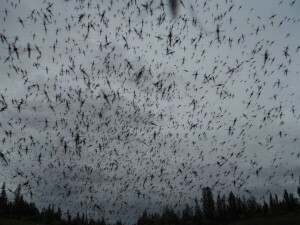 The bugs were atrocious, even by the standards of Canada’s largest wetland, which boasts the world’s highest concentration of blood-sucking insects. My arms and back were cut to pieces by blackflies as I hacked my way through the willows and traced the river’s meandering course. 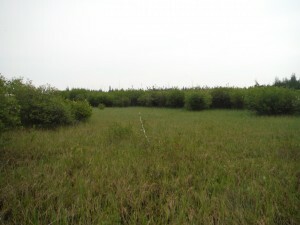 In several places were large beaver dams and lodges that stood nearly as tall as me. I followed the river as far as I could; until it eventually petered out into a vast morass of muskeg. That night, I made camp on a little patch of dry (or dryish) ground in the middle of muskeg, somewhere near the river’s swampy headwaters. A storm blew in off Hudson Bay that night, bringing lightning and rain. I had covered about 22 kilometres on foot from our base camp. The next morning, I began my return to Chuck at the base camp, wading back through foul muskeg and hacking through trackless swamp. When we were reunited, we could look forward to our easier return journey downriver, this time with the current. 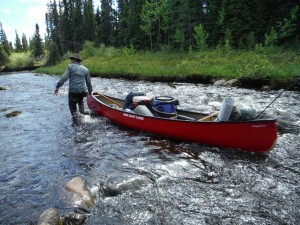 We paddled back to the tundra and the river’s mouth over the course of three days, feasting on pike and trout as we went, and acquiring yet more bug bites. To the west of the river at a distance of about a kilometre or so is an abandoned Cold War era military installation, known as a DEW line site (Distance Early Warning), established in the 1950s to monitor Canada’s Air Space from potential Soviet incursions. The site was abandoned decades ago and not much of anything except the cleared area for an air strip remains today. 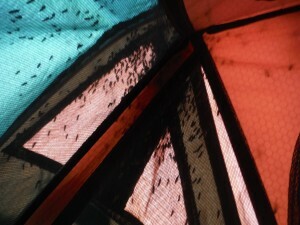 Thousands of mosquitoes swarmed my tent at night. Back out on the tundra, we saw nesting sandhill cranes, whimbrels, Hudsonian godwits, bald eagles, tundra swans, and a great variety of waterfowl. 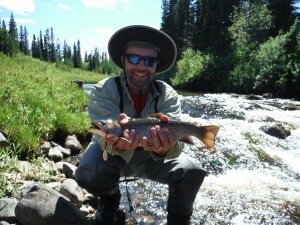 The river’s many small, shallow rapids proved easily to navigate, and at the base of them we usually found good-sized trout. 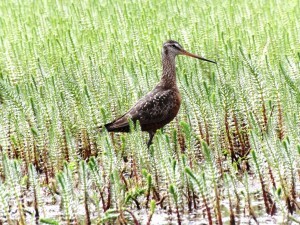 Hudsonain godwit near the river’s mouth. For the last night of the expedition (night 13), we camped on a beautiful promontory that juts out between the Brant River (or what is officially the Brant River) on the east, and on the west the nameless fork we explored. This promontory forms the fork between the two waterways. The next day, after some nasty weather and considerable delays, our pilot finally arrived—but we had some difficulty taking off. It took seven attempts before we finally built up enough speed in what little deep water the river’s mouth afforded for us to climb into the sky and head southward. After one stop on a lake to refuel, we were back in Hearst, Ontario, after a successful expedition. 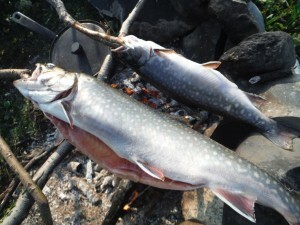 Trout roasting over our fire.